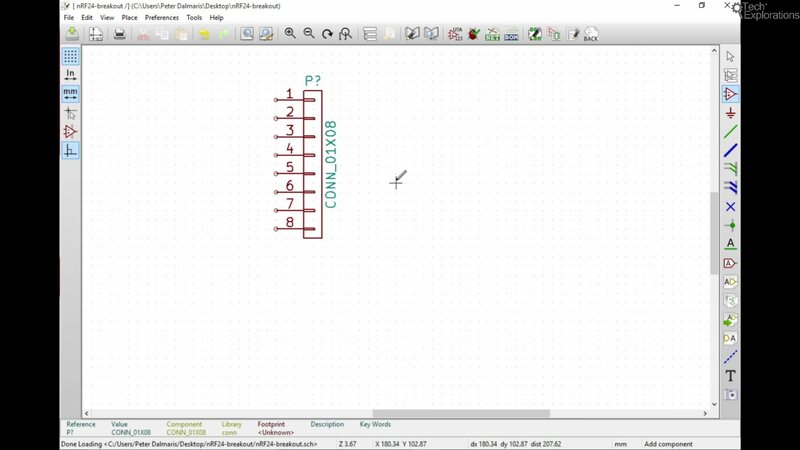 In this chapter we will begin the process of creating our first schematic in Kicad. Start by centering the schematic in the window so you can see the whole canvas. The board that we are building will only contain two components. The first one is a straight 8-pin connector and the second one is an RF24 component that we will plug into the board. The RF24 component does not exist yet in the component library, so we will have to create it. But the straight connector does exist, so we will start with this. Zoom in the canvas a little and then hit the A key on the keyboard. This brings up the component chooser. 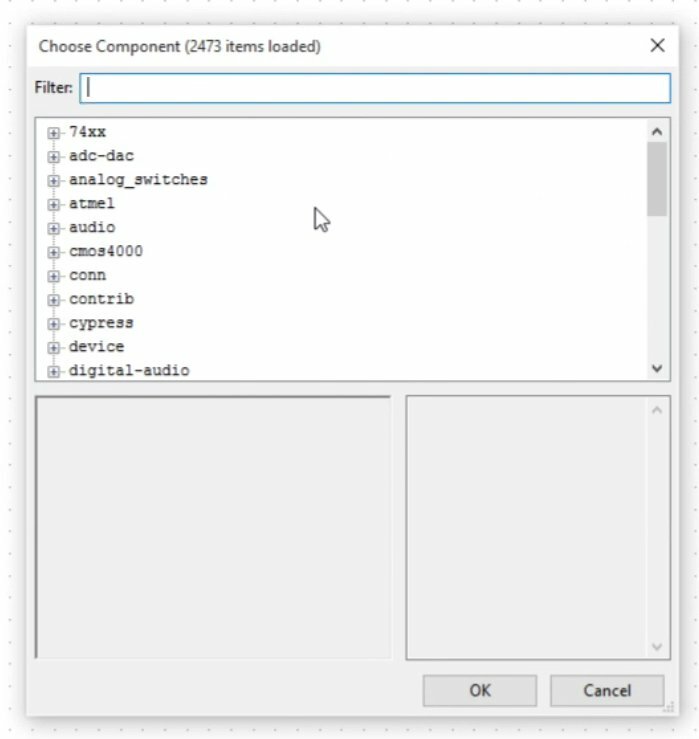 You can manually drill down these libraries and look at the components and figure out which one is the one that you’re looking for. 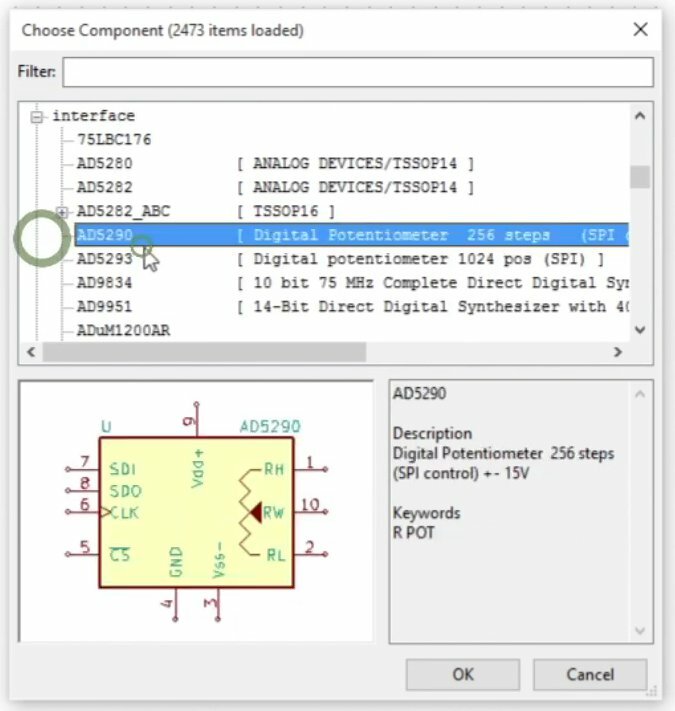 As you’re clicking on a component, you’re going to get a view of its schematic and some description of the component. Sometimes you will get a detailed description, some other times you will get almost nothing. 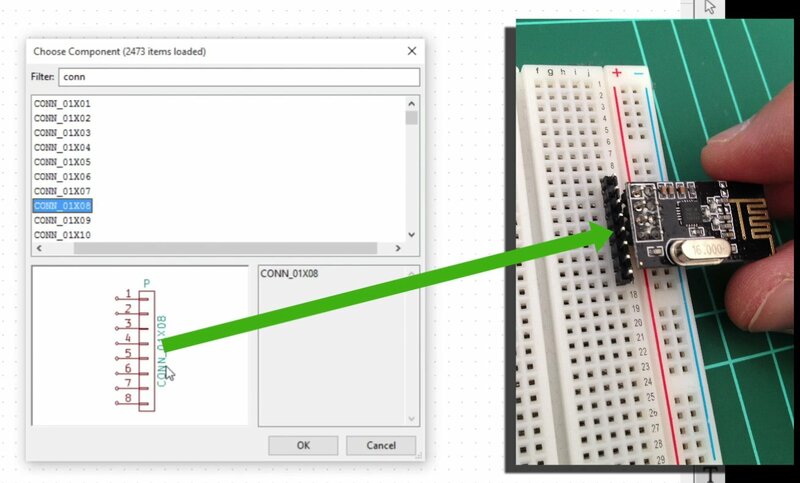 The component chooser often (but not always) contains details and a schematic preview. Probably, a faster way to do find a component is by using the filter. You can type a keyword, like “connector”, in the filter text box, and components that contain this keyword will show up. In this example, the keyword “connector” returns nothing, but “conn” returns several components. Use a keyword to quickly find a component. In this case, the 01×08 connector is what we need. You have just dropped your first component on the canvas! This connector, just like most components that have pins, has pins that are numbered one to eight. The component also has a unique designator, that starts with a P followed by a question mark “P?”. This indicates that the final unique designator for the component has not been decided yet. Fixing the designators is something we will do later on, automatically. There is also the name of the component, “CONN_01x08”. You can edit the properties of a component by putting your mouse over it and hitting the E key. “E” stands for edit. You can change its name, and several other values. 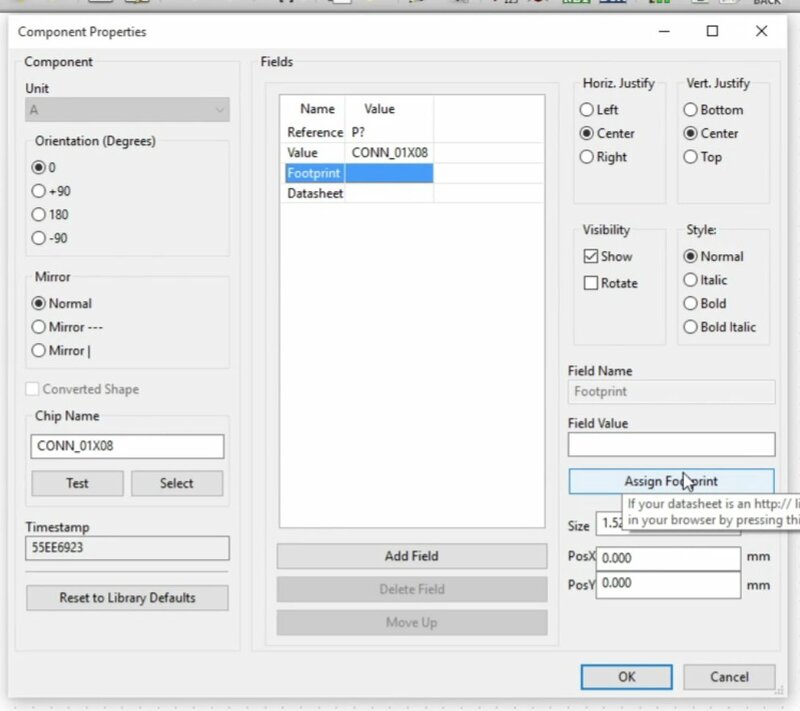 Place the mouse pointer over a component and hit the “E” key to show the component properties window. The parameters for components are set. It’s fine by me. I rarely have to make any changes to these components if they come out of the library. So I just hit on OK.
You can move your part around by placing your mouse over the component and hitting the M key. The component is now tied to the mouse pointer and you can move it around the canvas. Click the mouse right button to release the component and drop it back on the canvas. While the component is tied to the mouse pointer, you can also rotate it. Use the “R” key for this. Continue typing “R” until you’re happy with the orientation of your component. Lets look for the RF24 part round here. Hit the A key to go back to the component chooser and let’s see if something like that exists. Type “RF24” in the filter. Unfortunately, nothing of that description exists in the library. It seems like we have to make a custom built RF24 component for the schematic. We’ll do this in the next chapter.